Less than 6 days ago, Amy and I and several of our bravest friends, ventured out into the wild to shoot this awesome Vintage Americana concept that Amy and I developed. 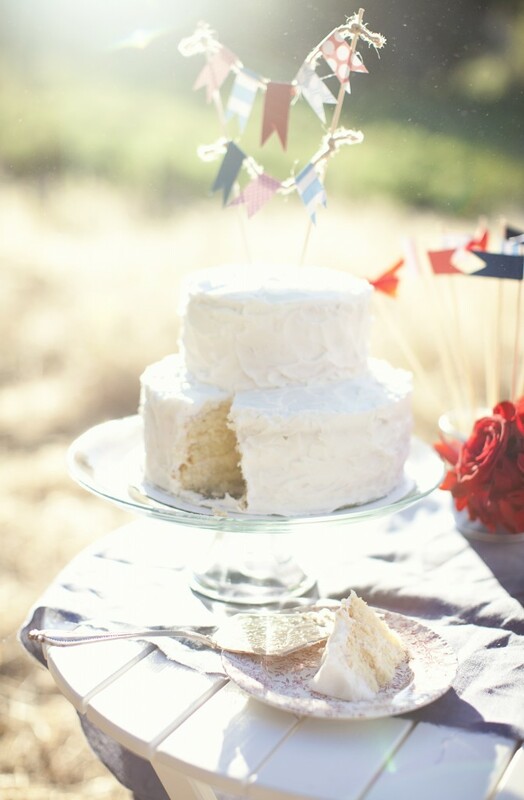 We set-up, styled and shot amongst the heat, bugs and sharp prickly bushes but we couldn’t be happier with the outcome. In less than one day we were picked up by one of our most favorite wedding blogs Green Wedding Shoes – what an honor! Summertime. Long, lazy summer days filled with fun, sun and memories. 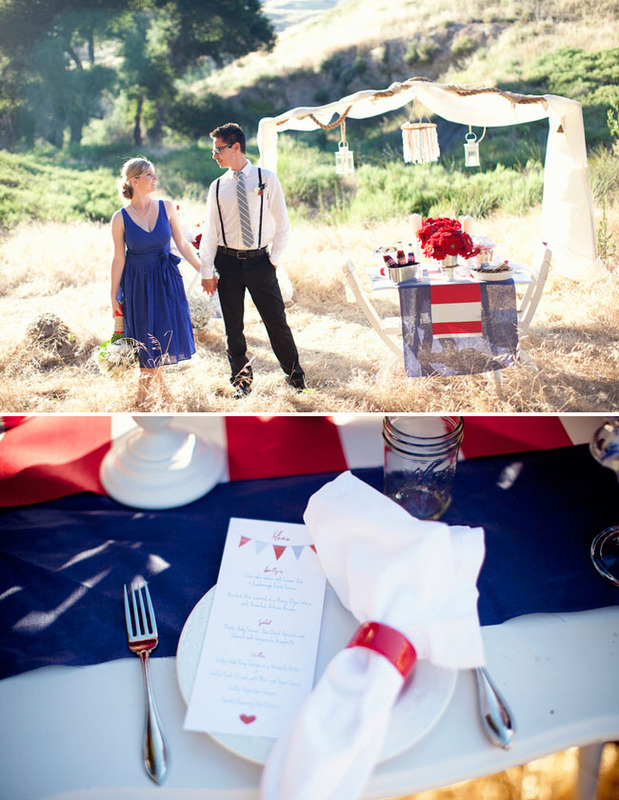 The inspiration behind this styled shoot was iconic summertime fun with an elegant infusion of vintage Americana. The rich blues and reds juxtaposed against the golden landscape and natural elements of jute rope, muslin and galvanized metal create a wonderful contrast. As a bit of background, shortly after Amy and I got word that our Outdoor Vintage styled shoot was going to be published in Style Me Pretty early last May we began working on our next shoot. We decided on a summertime 4th of July theme. Who doesn’t like vintage Americana? We had hoped to shoot it in late May before I left for my trip to Europe for job number one but there were several things that didn’t quite go to plan. So, I hopped off the plane on June 18th and got straight into putting the pieces together for the shoot a few days later. Many people ask me what my process is and how I come up with concepts that translate into an overall look. It’s really hard to explain – but simply said, I just go with what looks good to my eye. The only thing that I do in terms of planning is I decide what my elements are going to be and then look for ways to incorporate all of them into every aspect of the entire look. I always look for ways to include visually opposite elements together – in this instance rich red and blue with rustic galvanized metal and rope. The contrast between these elements creates visual interest and simply put – it makes them pop. When putting a look together you have to be flexible. I especially have to be flexible because my fabrics, papers and flowers are all purchased in an hour before work the day before the shoot – did I mention I’m a busy girl? You never quite know what you are going to find. My years of experience doing events and styling and just knowing where to go help me get through the reams of fabric and piles of flower options to what I really want for my design. If you have the time, then spend it but I find that my snap design decisions are always pretty much spot on – luckily. Oh, and you’ll need lists. Lost and lots of lists. I write down and sketch every concept and every element, so I don’t forget what I want to do and how I want to put it together. My mind always is running 100 miles and hour and sometimes I forget great ideas which is super annoying. So needless to say it was a late night before the shoot putting the finishing touches on my flowers and rope laded items but so worth it. With my Tahoe loaded up and ready to go, I ventured into the wilderness for the shoot. The spot is remote and stunning but with anything remote, it means lots of treks back and forth to the car. Once we got to our staging spot, we decided where were were going to set everything up and that’s when the flies decided to join us. Not just a few but thousands of them – its like they hadn’t seen mammal life in years. While we were fighting them off and after a couple of them had a nibble of my arm, the ants came out to visit as well. Ants for miles. Then while setting up in the long grass (I don’t even want to know what was in there) we were constantly picking out sharp prickles from our socks and shoes. Then it got hot – like really hot. I had to roll my jeans up because I thought I would be able to better feel the spiders and other scary things if they decided to take a stroll up my leg. A hot mess. Once we got everything set up, I got everything styled, cameras loaded (there must have been 5 total) we started shooting and from Amy’s behind the camera excitement – I knew we were looking good. I have to say that I am yet again blown away by that girls talents – she impresses me every time. Below, you’ll find images and more details of how to recreate some of these looks. Please also visit Amy’s site and the Green Wedding Shoes post for more information. Thanks to all of these amazing and talented artists who gave their time, resource and effort to make this day unforgettable! I love you! Whether it be in the wild or in the backyard, nothing says summertime like camping. The great thing about the structure is it is easy to put up, take down and transport. This can also be shortened up and used at the head of the alter and draped with different fabrics as well as fresh flowers. The Manilla rope and burlap were used as a focal point and carried through the whole look. The lanterns added to the rustic feel while carrying through the galvanized metal into the tent structure. 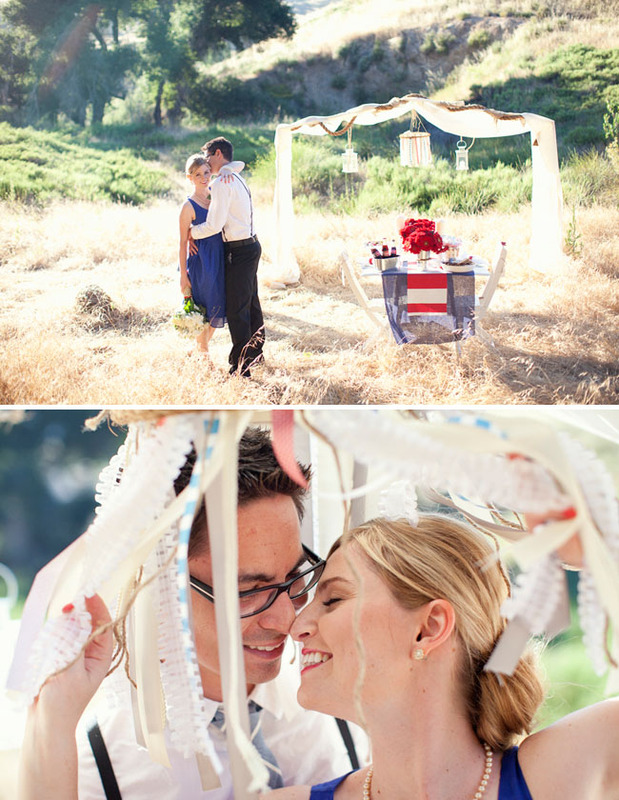 You can use any type of pop up tent structure to recreate the look. 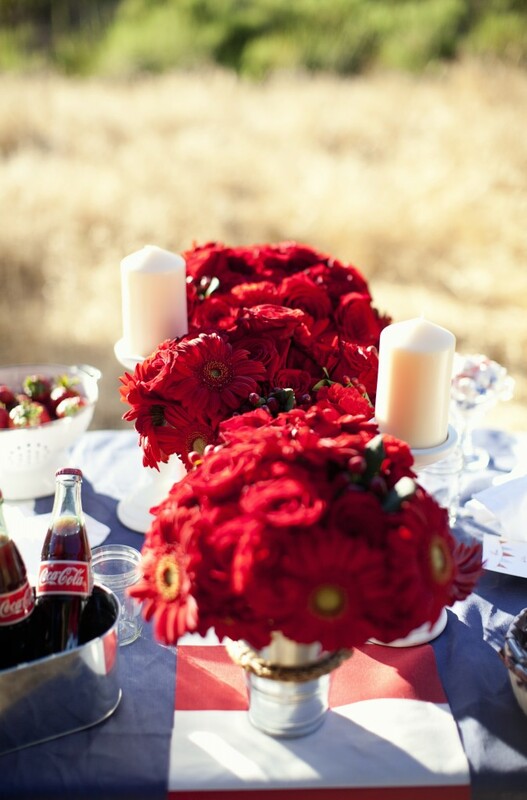 Iconic red Gerbera daises and long stem red roses in rope encased galvanized vases were perfect against the white vintage leaf table and blue linen runner. 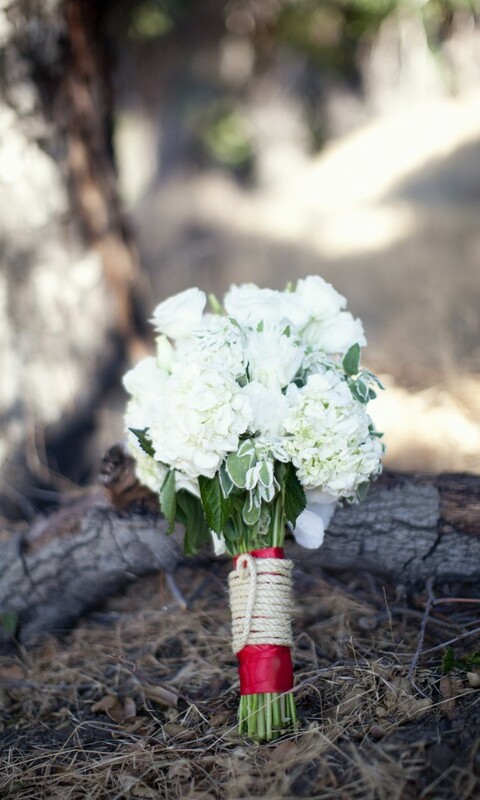 White hydrangeas were the focal point in the brides bouquet tied with red ribbon and rope. The ribbon chandelier is a fun and easy to recreate element that can be used for showers, birthday parties and more. It is essentially 4 – 5 different ribbons in the same color family, hot glued to a quilters ring and finished with some small Manilla rope. 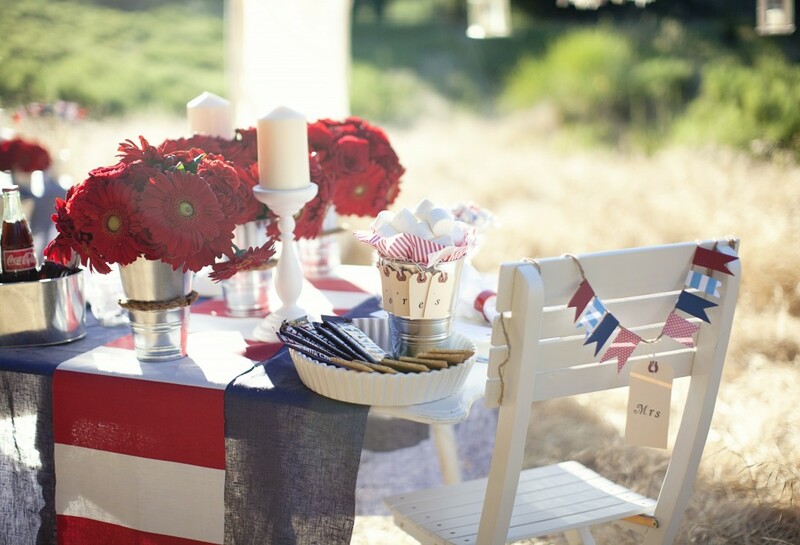 I added the vintage paper from the flag design to help bring some of the color into the tent element. Vintage looking paper in reds and blues helped carry the color theme through out the entire design. The flags and labels were incorporated in the the cake topper and the chair back designs. 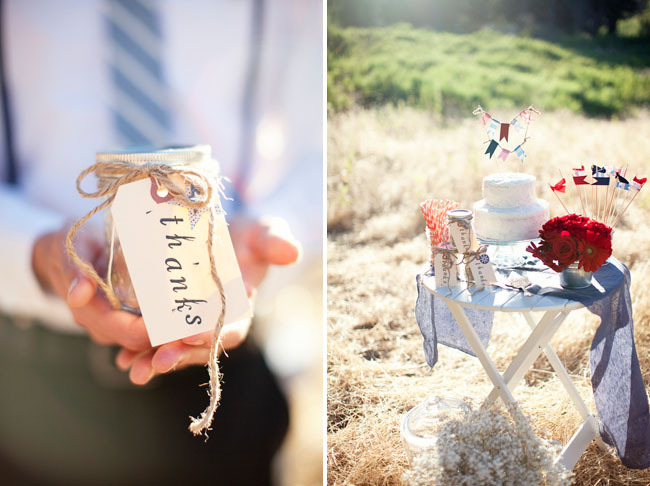 The labels and flags can be used for other elements like favors, place cards, etc. 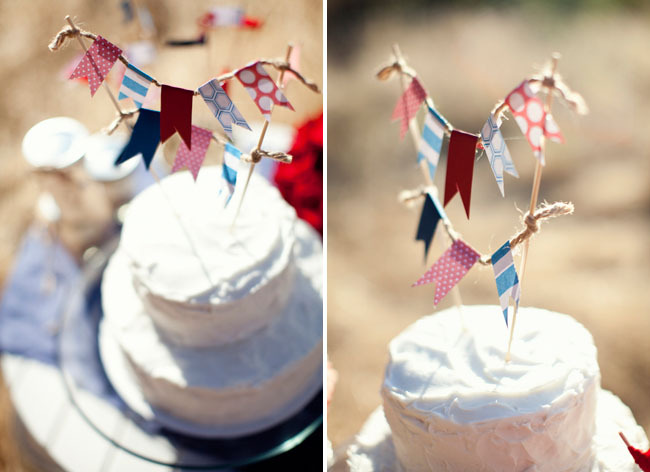 The flags are a versatile element and can be used with any color theme for showers and other parties. 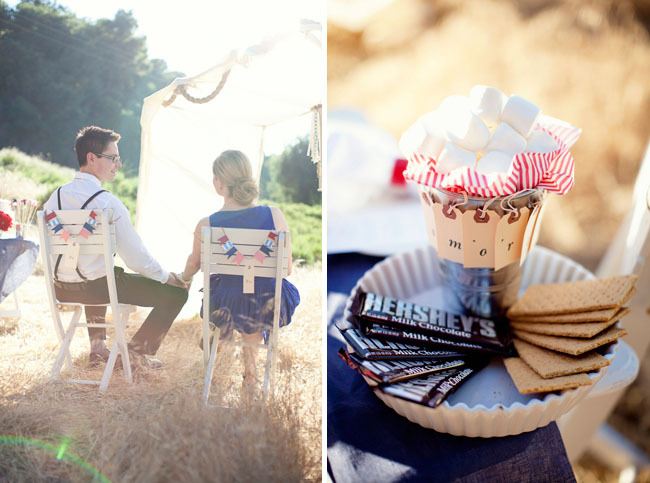 Mason Jars are perfect for lovely individual hot chocolate mixes for curling up next to the camp fire. 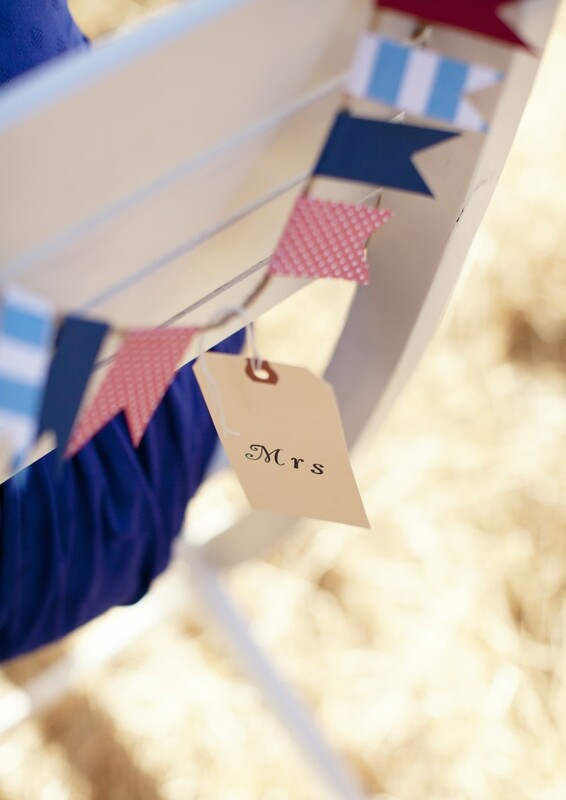 Tie them up with a twine bow and a vintage thank you label – the perfect takeaway. Wedding after wedding, event after event their paths kept crossing- it was meant to be. The two girls, one a photographer and the other an event designer, have formed a partnership where they design, develop and shoot creative projects together. You can see more of their work on www.amystonephoto.com and www.jessicaburns.com. Jessi….you did it again, amazing…it really looks beautiful. I feel inspired to be a little more Americana. This is so beautiful Jessica. You are so talented! !